How to Completely Change Your Daughter’s Body Image (and Yours)! It’s a new year and a time when many of us vow to make changes in our lives. It’s understandable, new year…new beginning. Seems like the perfect time to make changes to improve your life. I am all for bettering yourself but Mamas…please for all that is good and right in the world, PLEASE stop talking about your weight loss goals in front of your girls. In fact, stop talking about the way they look in front of them altogether. According to Dr. Leslie Sim, child psychologist, “Moms are probably the most important influence on a daughter’s body image. Even if a mom says to the daughter, ‘You look so beautiful, but I’m so fat,’ it can be detrimental.” And with 40% of elementary school girls wanting to be thinner (what the what??!!!!?) we have to do better for our girls. When my daughter started eating solids, I wanted her to begin with healthy vegetables. I won’t touch broccoli with a 10-foot pole, but I have never told her that. There have even been a few times that I have wrestled down one or two for her benefit. It was brutal, but I knew she had to see me eat it if she was going to eat it. The same is true with body image issues. I certainly have weight to lose and have struggled with weight and body image issues my whole life. While I have never been one to go around and talk negatively about myself, I have had to be extra careful when interacting with my daughter. She is going to be getting messages about how she is supposed to look for her whole life. They will come from family, peers, and social media. I need to make sure the message she gets me, her biggest influencer, is a positive one. No matter how old your girl is, there are some habits you can start creating now that will promote a healthy, positive body image. You may have heard “If you can’t say anything nice, don’t say another at all.” Live by it when it comes to body image. It’s more than what you say though. It’s how you carry yourself. I’m not suggesting that you have to get all dolled up, but you can walk tall, wear flattering clothes, and smile. All of these go a long way to projecting a positive body image. Your daughter is watching everything you do and say. I promise you, Mama, she thinks you are amazing. It is more than okay to tell your little girl how beautiful she is or how adorable she looks. She needs to hear this especially from her Dad or other male role models in her life. While you are complimenting her looks be sure to also compliment her hard work, determination, wit, sense of humor, critical thinking, creativity, accomplishments, and any other personality traits. If you don’t focus so much on how she looks, she won’t either. And, she will begin to understand that she and others are made up of more than what she can see with her eyes. Your daughter is going to see all sorts of images of the most beautiful looking women on the planet. She will look at these women in magazines, on tv, and social media and think that is normal. She will think that to be beautiful, you must look like these women. Even if she doesn’t bring it up, she will be internalizing these images and comparing herself to them. Be sure to talk to her about what she is seeing. Listen for opportunities to talk about what she sees vs. reality. This might be as subtle as her saying, “Wow she is so beautiful.” Without talking negatively about the women she sees ,you can explain that their life’s circumstances are different and that every woman is born with a unique body that is special to them. Remind her that what is important is to be healthy, take care of, and be proud of the body she has been given. Raising a girl in this day and age can be super challenging. 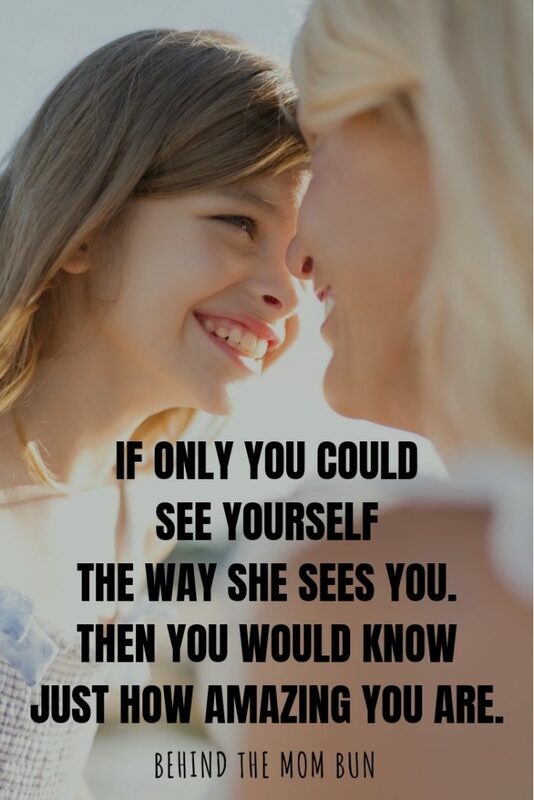 Helping your daughter to see herself as beautiful, inside and out, is a delicate balance between encouraging and not putting too much emphasis on her appearance. You can do it, Mama! You are as beautiful as your daughter thinks you are and let me say it again…SHE THINKS YOU ARE PERFECT! 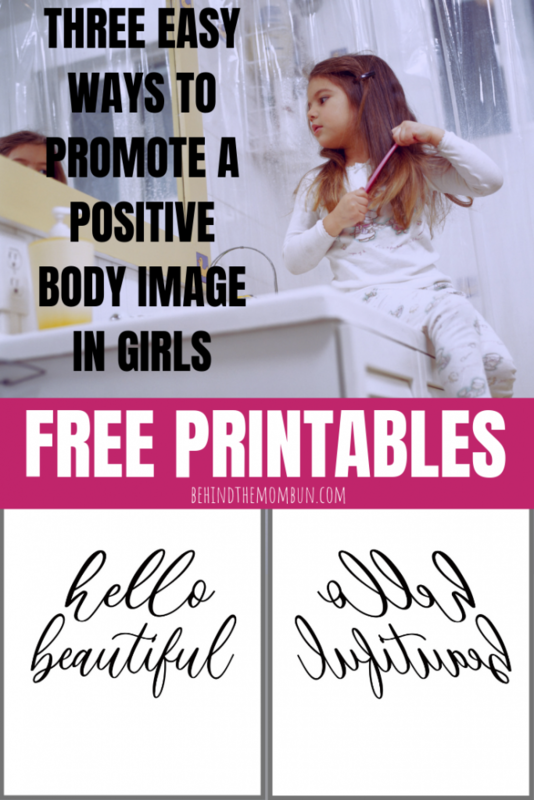 Grab your free Hello Beautiful printable here.